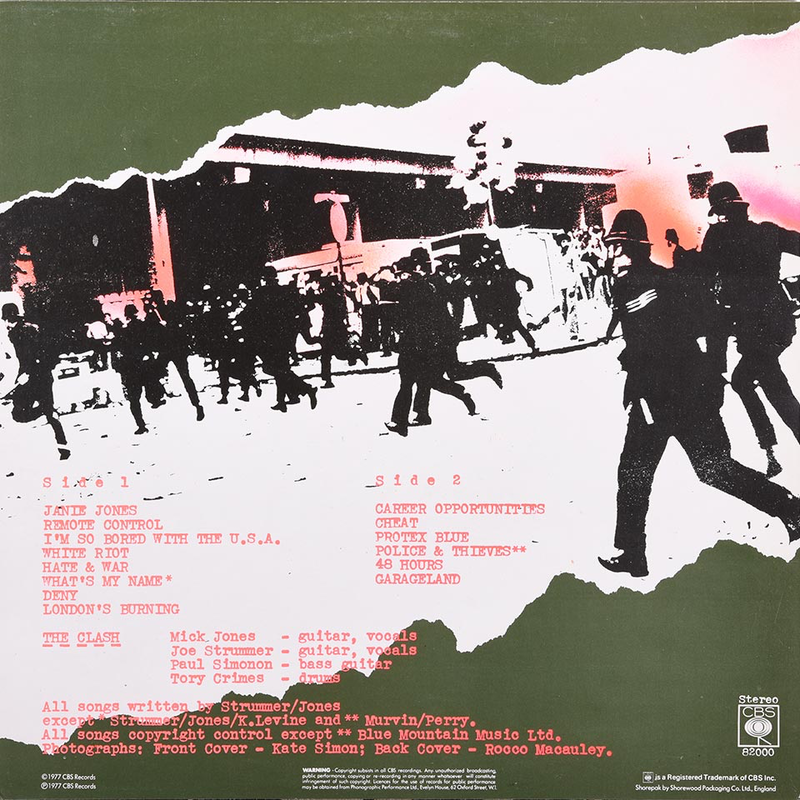 One of the genuine cornerstones of the UK punk explosion, this absolutely seminal breakneck ride through thirteen two minute or so songs, plus “Police And Thieves”, is so vital to understanding the seismic shock that punk was to the music scene in 1977. I vividly remember a friend of mine getting his first car and we drove from Buckinghamshire to Manchester for the sake of it, just because we could and slept the night in the car in a backstreet in the city’s warehouse district. We had one cassette to play - this album. We played it over and over, there and back. Its effect was that remarkable. We loved every minute - the buzzsaw guitar, the frantic drums, the rumbling basic bass and Joe Strummer’s barked, often incomprehensible vocals. Some people question The Clash’s punk credentials because Strummer was the middle class son of a diplomat and was slightly older and Mick Jones had been a Mott The Hoople fan and a Stones fan too (although they claimed not to be in their single release “1977”. Basically, this was irrelevant. Did The Clash blow a huge hole in the ceiling of contemporary pop music in 1977? Were they perceived by the youth of the time as politically and musically relevant? The answer is a firm “yes, not half” to both questions. On "Janie Jones", Terry Chimes’ upbeat drum riff heralds that start of this great album, Mick Jones’ guitar chops in, Paul Simonon’s bass rumbles and Joe Strummer’s rasping vocal enters the fray in this catchy song about a notorious 70s London madam who made the news for some reason that I cannot remember. On “Complete Control”, a non-album single, the band began with the line “they said release “Remote Control”, but we didn’t want it on the label...” indicating that CBS wanted this track released as a single but the band did not. 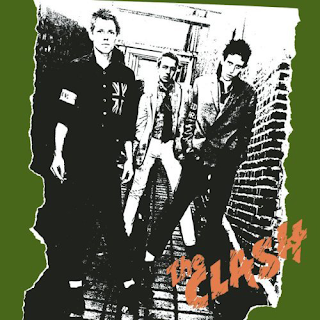 At three minutes long, "Remote Control" is almost a “rock” track as opposed to a “punk” one, introducing us for the first time to that riff from Mick Jones - unique and always musical. "I’m So Bored With The USA" sees a buzzsaw guitar crackles in the aggressive intro to this militant attack on the USA and its seemingly omnipresent culture, complete with fist pinching, singalong chorus. Jones and Strummer were caught up in some of the Brixton riots of the time, and felt somewhat detached from the protesting black youth all around them. The iconic breakneck classic punk rant that was "White Riot" was the result. The punk riff intro has rarely been bettered. 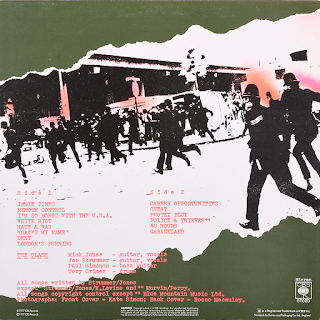 On "Hate And War" the racist mentality of contemporary fascist groups was the subject matter of this slightly slower pace track- “hate and war, it is the currency”. "What’s My Name" was another fast paced punker. “What the hell is wrong with me” barks Strummer. Then on the next track, “Deny - you're such a liar!” moans Strummer to an unreliable girlfriend. Even punks had girlfriend problems in between all that griping about society. "London's Burning" is a true Clash classic. Jones’ guitar chops stab in to a wonderful intro and then some angry lyrics about driving around London’s Westway elevated flyover “speeding around underneath the yellow lights”. London was burning with boredom, they exclaimed. Such an anthem of urban youth protest. Glorious stuff when you’re eighteen. There is a great moment, just a short while in, when Mick Jones' guitar slashes furiously straight to one of your speakers. Marvellous. "Career Opportunities" is another great track, about unemployment and the lack of decent job opportunities - “they offered me the office, offered me the shop, they said I’d better take any job they got”. Finger on the pulse in a sub-two minute punk song. Great guitar and drum intro too. Featured in the scene in the film "Rude Boy" when lead character Ray put the album on in his grubby bedsit room. "Cheat" is an angry tub-thumper about cheating if you can’t win, narrated in the first person but written as an observation of a nihilistic, selfish person, while "Protex Blue" is a short, sharp, furious pace song about condoms, apparently. The lengthy "Police And Thieves" forms what is definitely the album’s oddity - a six minute cover of Junior Murvin’s reggae classic, but here given an almost rock, slowed down approach, with a great riffy intro. The reggae rhythms are guitar-based and clunky, almost not reggae at all, apart from the fact that they are choppy. Either way, it gave a firm hint as to directions the band would take in late years. They were certainly not prepared to be tethered down to the punk "two minute thrash" ethic. Stiff Little Fingers put a similar extended punky reggae cover on their debut album, their cover was of Bob Marley's "Johnny Was", in very much the same style as this track. "48 Hours" is the shortest track on the album, and maybe the most forgettable. Fast and furious, but that’s about it, while "Garageland" is another semi-rock song to finish off - the story of the band’s progression to be a “garage band”. “I don’t want to hear about what the rich are doing” gargled Strummer. None of us did, Joe.